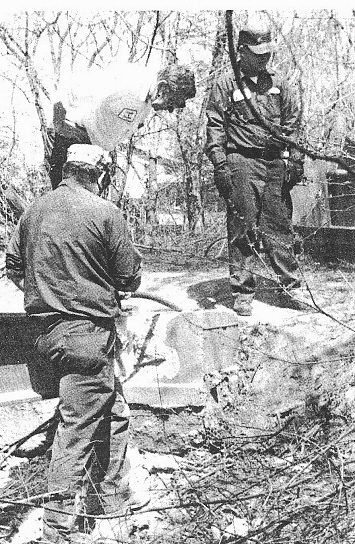 Two members of a public works crew chiseling out a concrete bridge abutment on a recent Thursday in evesham were tearing down what they had helped to build as farmboys about 30 years ago. In the years between, the bridge had gone from a passage for farm equipment across (Cropwell Brook) to "a nuisance, a contributing cause of flooding, and a danger to neighborhood kids in Woodstream" according to residents. No roadbed remained, only two 'I' beams crossing the water which attracted daredevils on bikes on one side and speed across the four inch wide trestles defying a four foot drop to brush and concrete. Howard Holtz and Ike Chapman, who took turns with Ray Longo handling the jackhammer under supervision of George Bingemann, general foreman, said that they had helped to lay the concrete-brick foundation when they were kids working on the Lippincott and Vennel farms. "There used to be an irrigation ditch right over there," Holtz pointed, "and lots of times we had to pull the cows out of the mud in the creek when they mired down." The four men had spent a better part of a morning attacking the old structure, which was slow to give and had piecec of led embedded in it. Owners of the three homes on the north side of the creek on Hamilton Road had found that when storm drainage from the development poured into the creek during heavy rains, debris and trash washed down and was held by teh structure, contributing to damming and backflooding. water spread out past the natural flood plain of the creek and up into the yards, leaving the debris when waters receded. Lester Artz of 205 Hamilton Road finally brought the problem before the Township Council and the Manager, Charles Balczun, after a recent meeting. Calls by other neighbors had not brought action, he said. "I had to clean up tons of stuff after every rain. We even had ducks down there, it was a regular lake," Artz said. In addition, children used the bridge termed a "landmark" by some as a thorofare through the properties, he said. A neighbor's son had 10 stitches after a fall on the bridge, he added. The flood plain of the creek is Township-owned property, according to Manager Balczun. He estimated that the removal would involve "six or seven tons of material." Artz said on Monday that crews were still cleaning debris out of the creek. "Now were waiting to see what will happen during the next rain," he said.